It's the Christmas season - Christmas is only weeks away. But Christmas isn't really on your mind right now. That's because you're in your car enduring a day of errand running. Christmas season or not, you've got chores you've got to get done. One of your errands is to stop by a local business and drop off some paperwork that needed your signature. That's it coming up on the right, so you swing into the parking lot, pull up to the building…and your jaw drops. Because right in front of you, soaring to nearly 3 stories in height, is one of the most impressive outdoor Christmas trees you've ever seen in your life! You know it can't be a real tree, but it sure looks like one with all the lush greenery it displays. And the lights and ornamentation are just gorgeous. Quite simply, it's an awe-inspiring sight. Suddenly, Christmas IS on your mind again. And the day's burdens seem a bit lighter, and your mood a bit brighter. After all, it's Christmastime! The little fictional scenario above - or variations of it - plays out countless times each day in the weeks leading up to Christmas. And that's why thousands of commercial Christmas trees are sold to businesses and municipalities across the world each year. 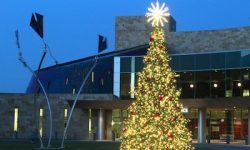 Commercial Christmas trees - whether outdoor Christmas trees or trees used for indoor display - are wonderful tools for attracting attention and generating goodwill among customers, clientele and passersby. After all, nearly everyone delights to the sight of a Christmas tree. And when the tree is a spectacular giant, aglow with Christmas lights and glistening with ornamentation? It's an awe-inspiring sight that works to delight both young and old alike! In fact, large outdoor Christmas trees serve as the focal point for many of the largest, most popular Christmas festivities worldwide. But even smaller trees can offer a draw and P.R. factor to businesses that just aren't available at any other time of the year. There's no getting around it - commercial Christmas trees aren't cheap. Or at least, quality trees that are worthy of the investment aren't cheap. But in return for your investment you'll be getting a tree that can serve as the crown jewel of your company's Christmas display for decades to come. As the video below shows, our trees are handcrafted by American workers and built to last. Quite simply, no other company can match the consistent quality that we offer with our commercial Christmas trees. That means that each of our trees will give reliable service as a delightful draw for many, many years.